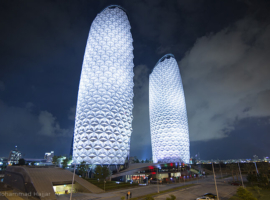 The awarded and 145 metres high Al Bahr Towers accommodate the headquarters inter alia of the Abu Dhabi Investment Council and the Al Hilal Bank. 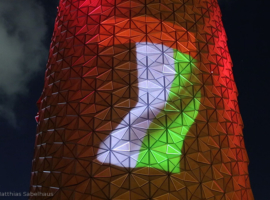 On the occasion of the National Day of the United Arab Emirates an impressive multimedia show should be realized at the towers in Abu Dhabi. 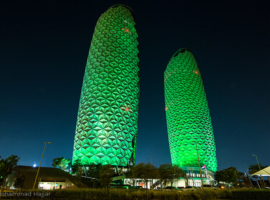 Thereby the convex façade should be illuminated homogeneously and also receive a video projection as well as laser highlights in terms of laser architecture mapping. 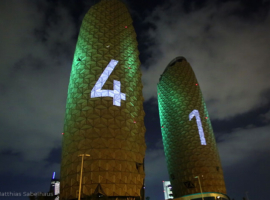 AO Lighting realized as general contractor with its creative department AO Creative an impressive multimedia show. 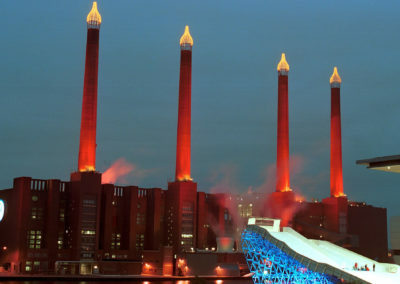 Thereby a dynamic and colorful 360° illumination was staged at both towers. AO Creative used intensive colours to draw all eyes to the cocoon-like architecture. 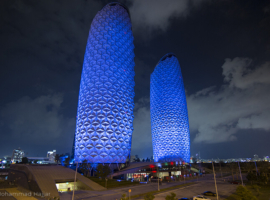 The futuristic towers were transformed one moment into a huge national flag, then bathed in deep marine blue that gave way in turn to shining white. 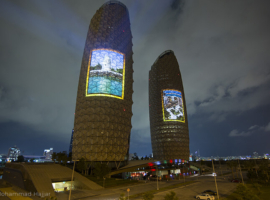 A video projection on the façade complemented the light show. 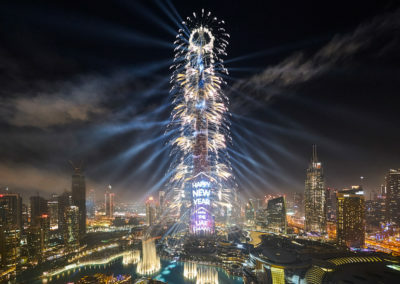 In whatever raiment they appeared, the evening choreography transformed the towers into a dazzling highlights at the Abu Dhabi skyline. 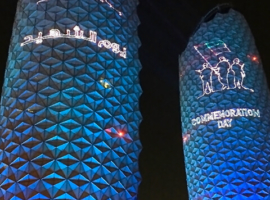 Since the 44th National Day celebrations laser architecture mapping is the latest completion of the light concept. 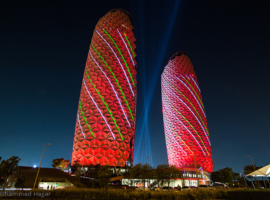 By using laser mapping aspects in the show AO Creative mastered to underline the buildings magnificent architecture. 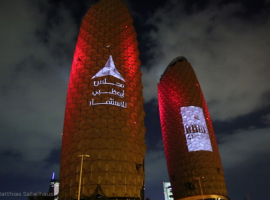 This kind of detailed mapping on each of the mashrabiyas of the façade had never been done before in the UAE. 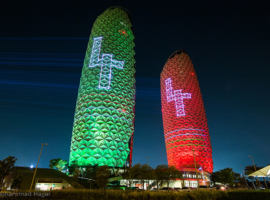 The whole team had a very clear vision of how the laser mapping should be integrated into the overall lighting show that AO Creative adhered to from the start and realized successfully. 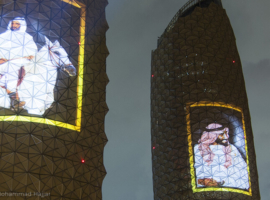 Each of the triangles of the sun shade system had been digitalized to create these beautiful effects. 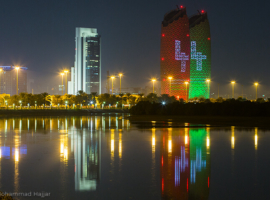 Since 2012 AO Creating is involved in the lighting design for the National Day illumination at the Al Bahr Towers. 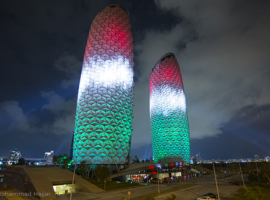 December 2012 – As full service provider A&O Technology illuminated both awarded and 145 metres high Al Bahr office towers in Abu Dhabi with a colourful dynamic lighting in line with the celebrations of the 41st National Day of the United Arab Emirates. 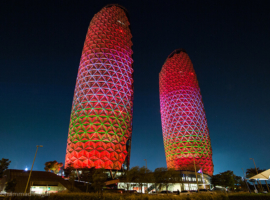 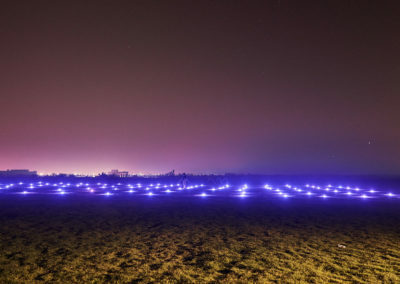 A&O Technology realised the visualisation, planning and execution of the brilliant colourful dynamic illumination. 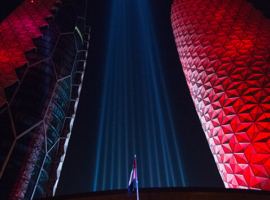 The bright light of the FALCON 6000 CMY and SKY FALCON ARC colour 1200 floodlights immersed the towers in UAE national colours, whilst video projections were showcased on the front facade of the buildings.